Can’t wait for years of these blogs to accumulate? Want them delivered in an actionable, logical sequence? Want to share BERKONOMICS with others in your group or company? Get a graduate course in Berkonomics. Read and apply over 300 insights from Dave organized from start-up through liquidity event, and concentrating on the strategic aspects of growth. Share Dave’s principles with your managers and board. Spend time with this internationally recognized business expert, author and keynote speaker as he guides you through stages of your corporate growth, using his experience and wisdom to point out opportunities and roadblocks along the way. Graduate with a degree in Berkonomics, and use these insights to drive your growth and business success. Order here: Click to Berkus.com books page, All of Dave’s Books are now fulfilled by Amazon.com, and eligible for Prime shipping. Also available form booksellers everywhere. I had the honor of watching Dave Berkus speak not once but twice this weekend at the Morgan Stanley Doolin Group’s Client University (Jan 23, 2106)! These books I will order and of course if you wish to really understand the core message of metrics and the excitement of technology’s opportunities, his seminars and lectures are also valuable. Dave is friendly, amusing, and a great speaker as well as obviously writer. Dave Berkus true expertise lies in not just measuring statistics about subject matter, but measuring what’s relevant and filtering that into actionable intelligence within the context of specific business purposes. The use of examples good and bad illustrate the tasks. 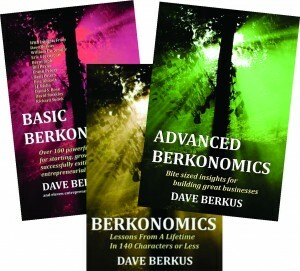 Dave Berkus has honed his skill and displays it for the world to be inspired about in books and in lectures. He has a famous reputation for metrics in the start up community, including at least one of two largest Seattle angel/venture capital firms that require his metrics to be cited in all executive summaries submitted. Thank you Dave Berkus for adding value to others!